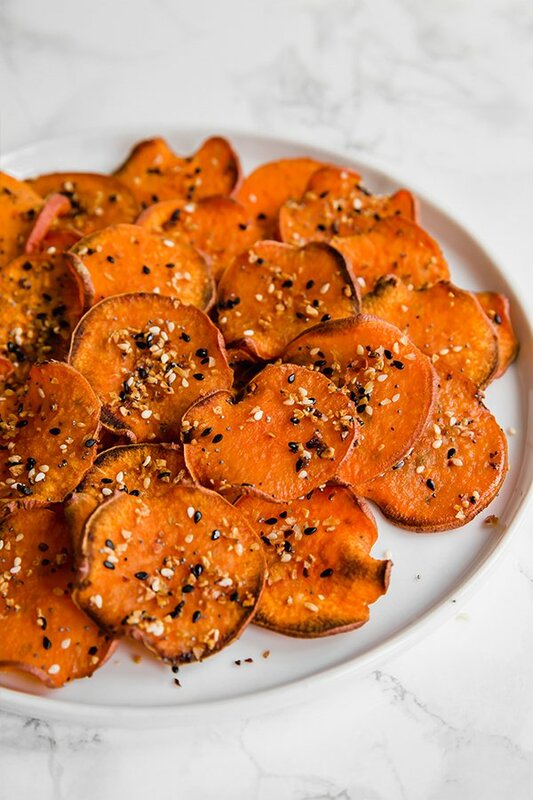 These sweet potato everything bagel chips are the ultimate crunchy snack! They’re a healthy paleo chip made with everything bagel seasoning. Oh yes, I went there! When I first saw everything but the bagel seasoning popping up at stores like Trader Joe’s in tons of different recipes, the wheels in my mind started turning. As a native New Yorker, I’ve had my fair share of everything bagels covered with cream cheese, as well as a bags of crunchy bagel chips. So, why not recreate a paleo version of bagel chips?! 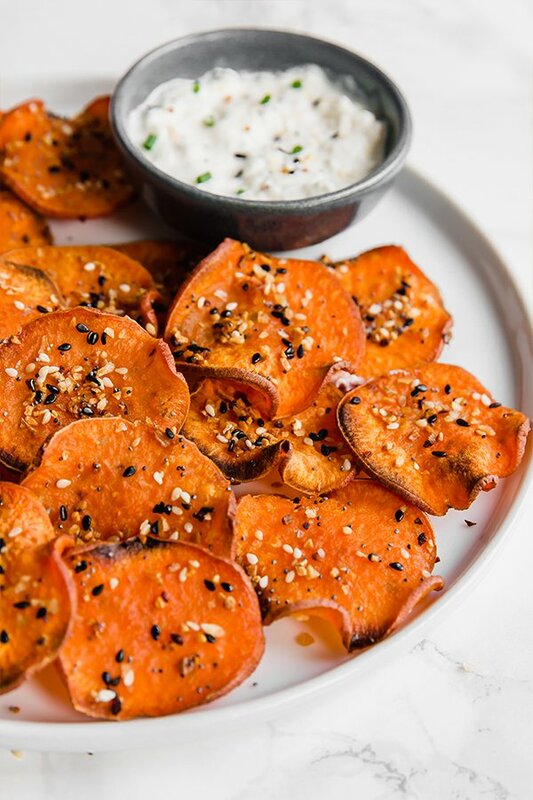 These everything bagel sweet potato chips have the classic flavor of everything bagel, on a starchy, crunchy sweet potato chip. It’s reminiscent of everything you love about everything bagels and bagel chips, but made with all real food! 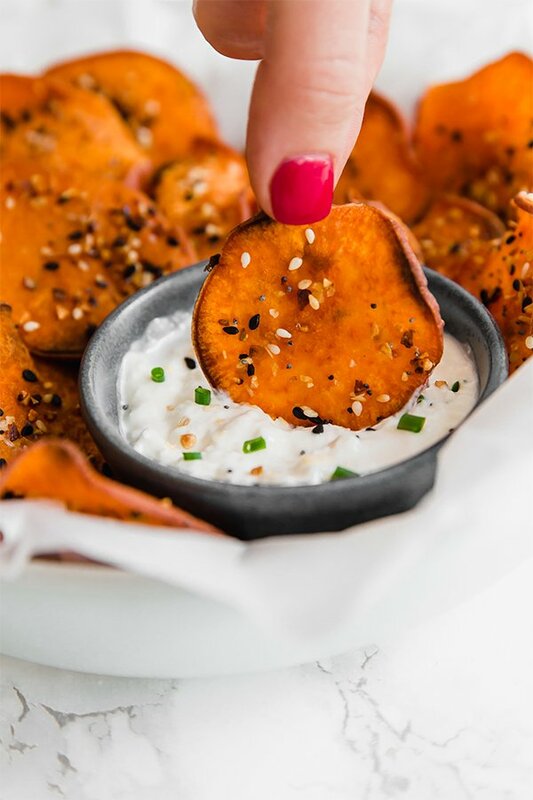 You can eat these sweet potato chips by themselves, or you can dip them in a cream cheese dip like kite hill almond milk cream cheese or the homemade version that I’ve included with the recipe. Avocado oil is a great neutral-tasting oil that’s good for high heat. I haven’t tried other oils, but I think this is the best choice for the chips. This seasoning has been all of the rage recently! You can get it at Trader Joe’s, or you can get similar versions online like this. This is an optional addition, but it’s really fun to dip these in cream cheese! You can use a dairy-free cream cheese like kite hill, or make your own as seen below. Wash the sweet potatoes well and scrub the skin to remove any impurities. Using a mandoline slicer, carefully slice the sweet potatoes on a 1/8″ setting. Lay out the sweet potato chips on the baking sheets and evenly spaced. Coat each side with 2 tbsp of avocado oil. Top one side of the chips with 1 1/2 tbsp of the everything bagel seasoning. Bake in the preheated oven for 10 minutes. Remove from the oven and carefully flip with tongs. Add the remainder of the bagel seasoning to the other side of the chips. Place in preheated oven and bake for another 10 minutes, or until crisped to liking. Serve with cream cheese dip if desired. Combine all of the ingredients and stir until well combined. Season further to taste. This wedge salad is a delicious and easy side or main dish to serve for warmer days. It’s paleo, whole30, keto, and easy to make AIP. I love wedge salad. It’s one of the only salads that I would eat when I was younger and one that my husband likes to order when we go out to eat. Wedge salad can often just be a vehicle for tons of cheese and low-quality dressing and isn’t always the most nutrient dense salad in the world. So, making it home can often be a much better option. 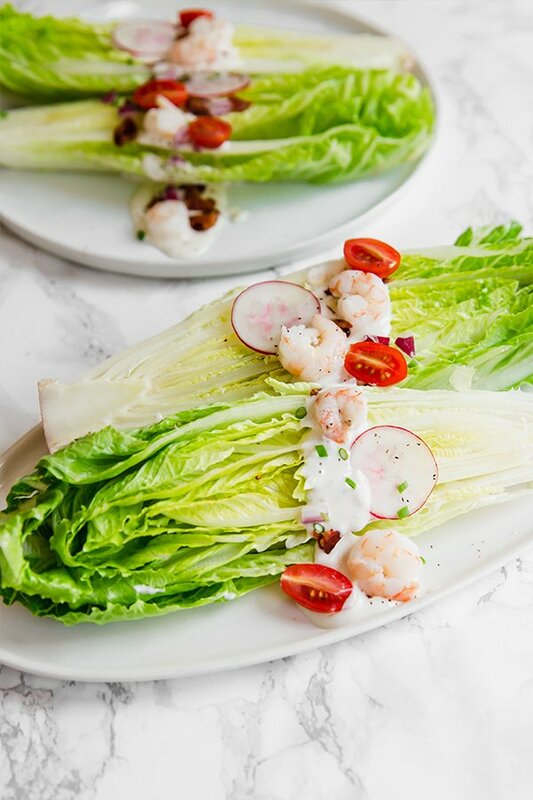 This wedge salad is made with romaine lettuce to keep it more nutrient dense, along with a dairy free ranch, and tasty toppings like shrimp, radish, bacon, and red onion. It’s a great main dish if you want something a little lighter, or you can serve it as a side or appetizer for a picnic or BBQ! Iceberg lettuce is the traditional way to make a wedge salad. It’s crunchy, easy to cut, and cheap. But let’s be honest… it’s not super nutrient dense. 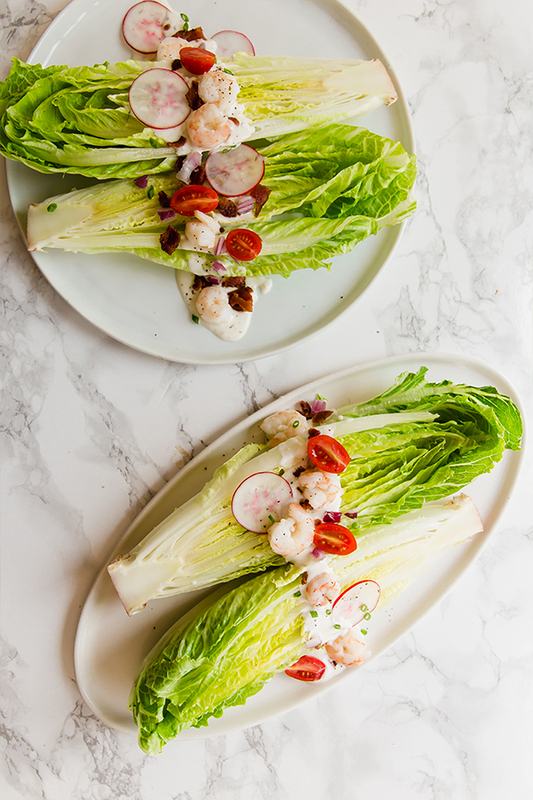 You can for sure keep it classic with iceberg lettuce, or if you want to up the nutrient density of the salad, you can simply just slice romaine hearts in half! What’s a wedge salad without bacon, right? Bacon is always welcome in my book. You can leave the tomatoes off if you’re nightshade free, and add toppings like red onion and sliced radish. These add some more flavor and nutrient density to the salad. Using a large skillet, cook the bacon on medium heat until crispy. Remove from the pan and set aside, leaving about 2 tbsp of fat in the pan. Add the shrimp to the same pan and cook for about 2 minutes on each side, or until the shrimp are pink. Set aside and allow to cool slightly. Prepare the wedge salad lining up three plates. Washing the romaine hearts well, slice in half and divided between the three plates. Dress each salad with the ranch dressing, red onion, tomato, radish, bacon, and shrimp. Finish with chives and black pepper. Ranch dressing options include Primal Kitchen Ranch or Paleo dump ranch. For AIP you can use, AIP ranch dressing orAIP avocado ranch dressing. 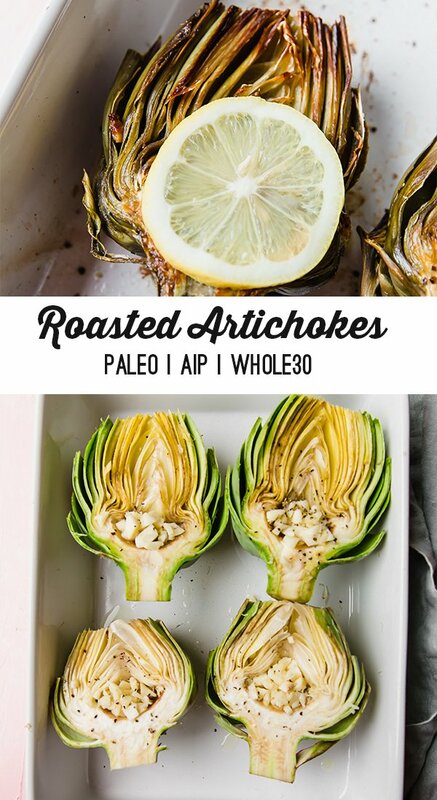 These oven-baked artichokes are easy to make and delicious to eat! Learn how to bake and eat this beautiful and unique vegetable. I don’t think I ever even considered trying to make artichokes at home until a few years ago. I never even took a second glance at them at the grocery store. Yes, they look beautiful, but they also looked really complicated to me! I’ve heard of artichoke hearts in salads, dips, and on pizzas, but a whole artichoke? Well, in reality, it’s really not that hard, and it’s really delicious! This recipe for oven baked artichokes is a springtime staple! Serve it with a protein like baked chicken or even a steak, and enjoy! Artichokes are rich in fiber, Vitamin C, and help support the health of the liver by increasing bile flow. Plus, it’s always great to mix it up by adding new vegetables to your diet! Every region is different, but I don’t have trouble finding them at grocery stores like Sprouts, Whole Foods, and Natural Grocers when they’re in season. What time of year can you get them? March through May is peak season for artichokes and when you’ll find them the most abundant and for the best price. I’ll see them every once in a while out of season, but spring is the best time to get them. How do you prep them to be baked? Use a sharp knife to slice off the pointed top of the artichoke. Slice any excess off of the stem on the bottom of the artichoke, only leaving a short base. Remove the hard, short leaves at the base of the artichoke by simply pulling them off. There should only be 3-5 of these or so. Using kitchen scissors, snip the pointed tops off of each leaf, being careful as these can be sharp. I’ve pricked myself before when I was being careless! Slice the artichoke in half vertically. Use a spoon to scoop out the fuzzy part of the inside of the artichoke. Brush the artichoke with lemon juice to prevent browning. It sounds like a lot of steps, but they’re really easy to work with! They’re not hard to cut like squash or even sweet potato, so the process goes quickly, and the results are beautiful. 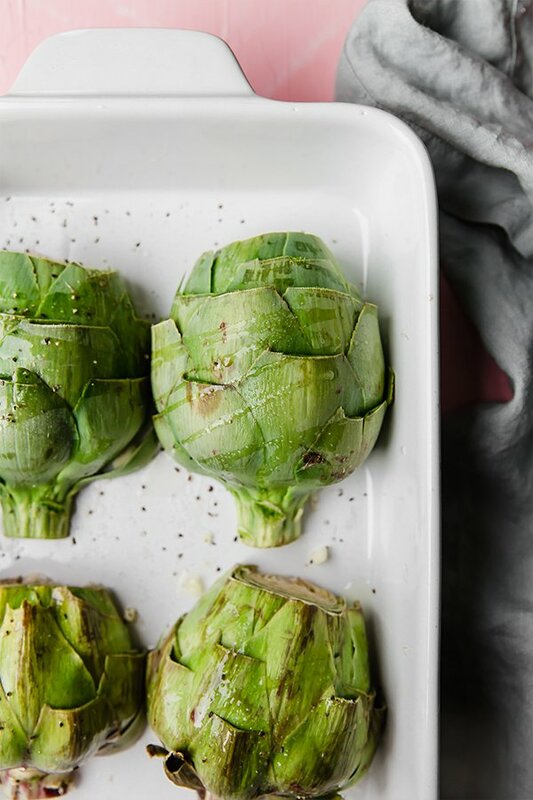 Most people only ever eat the heart of the artichoke, and they’re seriously missing out! The leaves are great too! All you have to do is pull off the leaves and slide your teeth over the base of the leaf to enjoy some of the meat of the artichoke. I like to dip the base of the leaves in melted ghee for flavor. There’s not a ton to get out of with the leaves, but with the number of leaves there are, it adds up! The heart is the innermost part of the artichoke that’s connected to the stem. It’s the meatiest part of the artichoke and you can just nibble on it easily! The star of the show. I like to make at least two at a time (one for both me and my husband) but will usually make an extra for leftovers! Minced garlic cloves roasted inside the artichoke add an amazing flavor. This adds flavor as well as prevents the artichoke from browning too much. The basics are great for this recipe. You can omit the pepper for AIP. You don’t need to dip artichokes in butter or ghee, but man is it good! I do not love using aluminum foil in cooking. Aluminum leaches into food and it’s just not ideal. However, if you’re okay with using it for one dish here and that’s what you have, it does work for recipes like this. You can also use something like a lid over a casserole dish to create the same steam effect that the foil does. 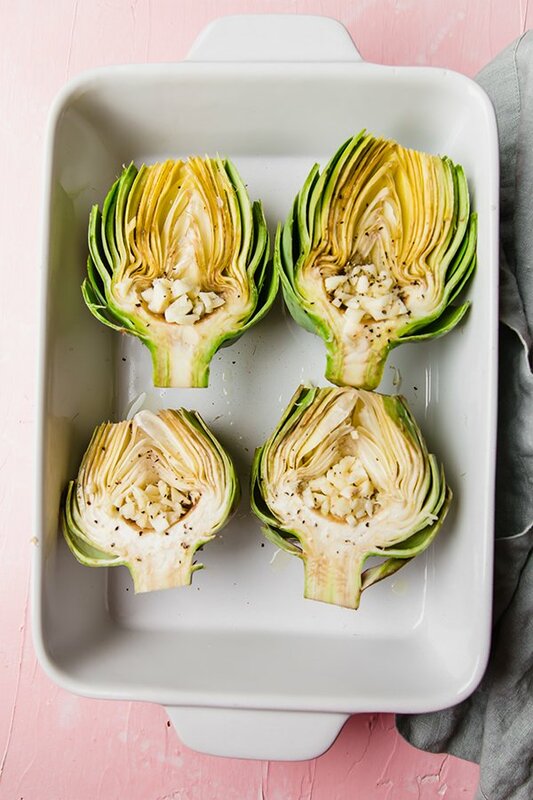 These oven-baked artichokes are a flavorful spring side dish! Preheat the oven to 400 F and prepare a casserole dish (see notes about having a lid or something to cover the dish) and very lightly grease with oil. Prepare the artichokes by cleaning well, and using a sharp knife to slice off the pointed top of the artichoke. Slice any excess off of the stem on the bottom of the artichoke, only leaving a short base. Remove the hard, short leaves at the base of the artichoke by simply pulling them off. There should only be 3-5 of these or so. Using kitchen scissors, snip the pointed tops off of each leaf, being careful as these can be sharp. Slice the artichoke in half vertically. Use a spoon to scoop out the fuzzy part of the inside of the artichoke. 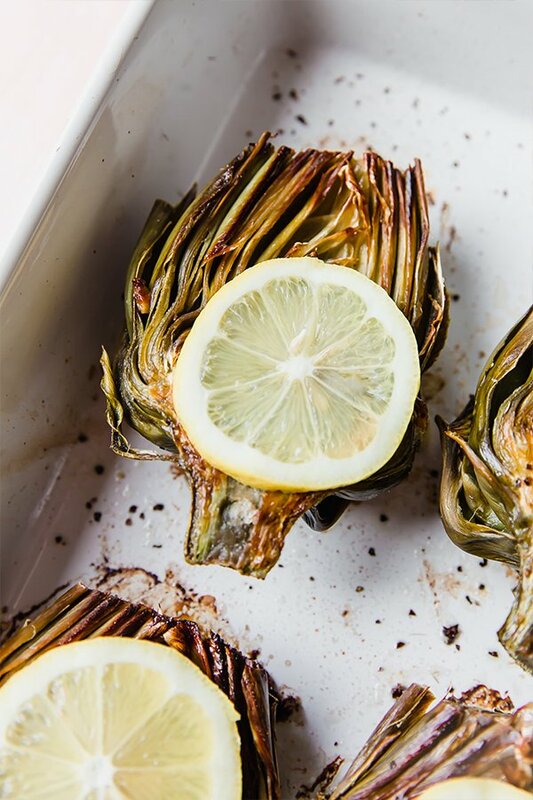 Brush the artichoke with lemon juice to prevent browning. Place the artichoke leaf side down, and heart side up in the casserole dish. Fill the hearts with the garlic cloves and generously add about half of the salt and pepper and half of the oil. Carefully flip the artichokes (using your fingers to hold the garlic under the artichoke as best as you can) leaf side up and add the rest of the salt, pepper, and oil. Bake in the oven for 20 minutes uncovered. Remove from the oven and cover the casserole dish and bake for another 20-25 minutes or until the leaves easily pull from the artichoke. 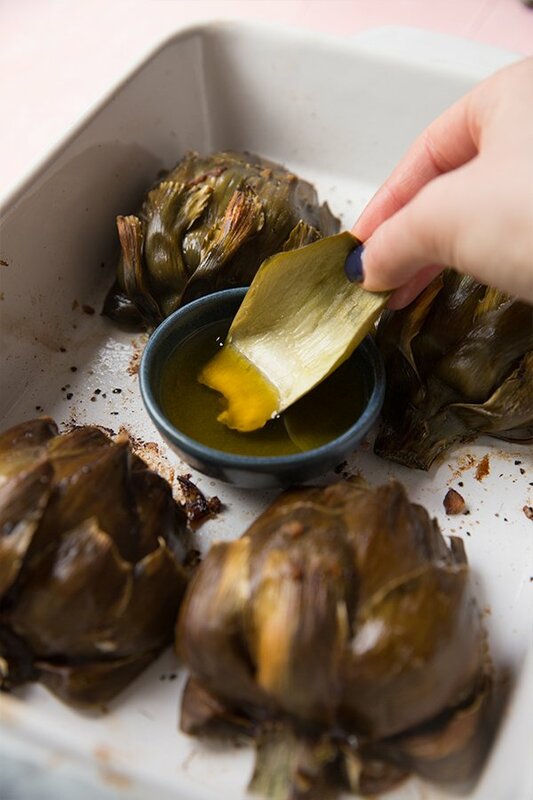 Allow cooling slightly before using a spoon to flip the artichokes. Garnish with lemon wedges and serve with optional melted ghee. To eat the artichokes, pull off the leaves, dip in optional ghee and slide your teeth over the base. Repeat with all of the leaves until you get to the heart, which you can also enjoy with ghee. I do not like using aluminum foil in cooking. Aluminum leaches into food and it’s just not ideal. However, if you’re okay with using it for one dish here and that’s what you have, it does work for recipes like this. You can also use something like a lid over a casserole dish to create the same steam effect that the foil does. 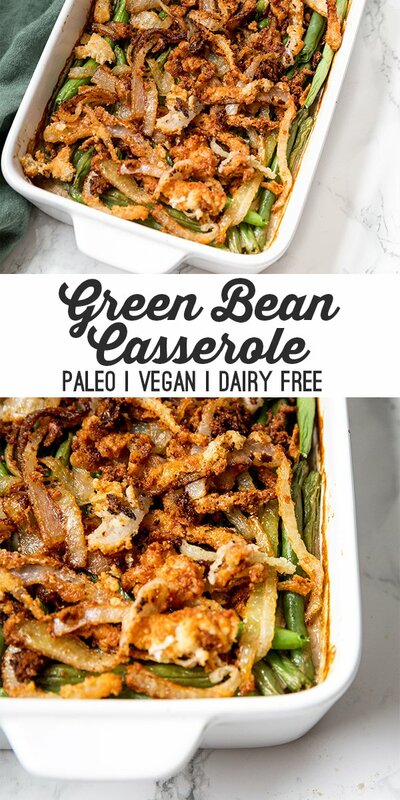 This paleo green bean casserole is the real deal! It’s made with homemade cream of mushroom soup, french fried onions, and is free of grains and dairy! 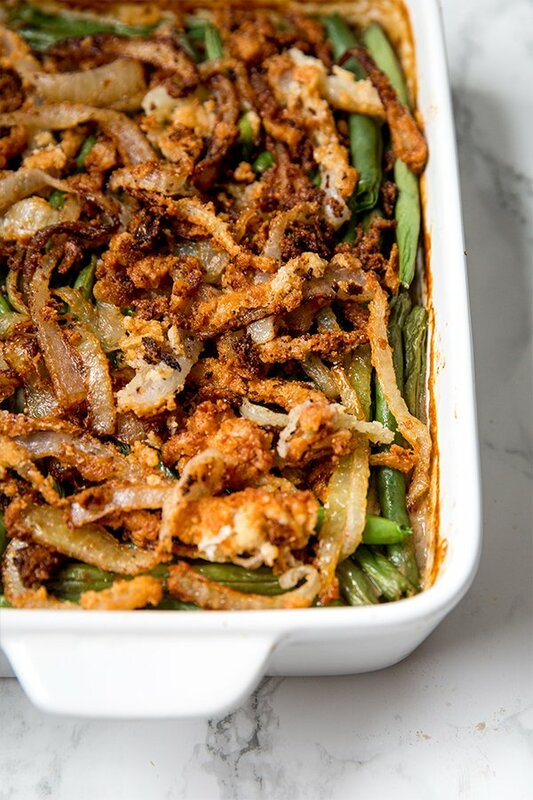 You didn’t think I could let Thanksgiving go by without sharing a green bean casserole recipe, right? Not a chance! I never even had green bean casserole until I was in my 20’s and technically gluten free, but would splurge on the holidays. And oh man… what a tasty splurge it was. 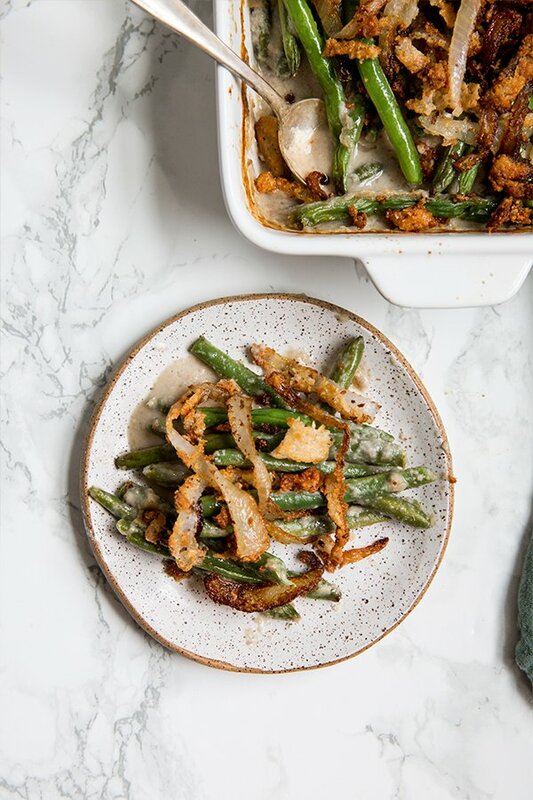 The creamy and flavorful mushroom soup, the tender green beans, the crispy french fried onions… woah. 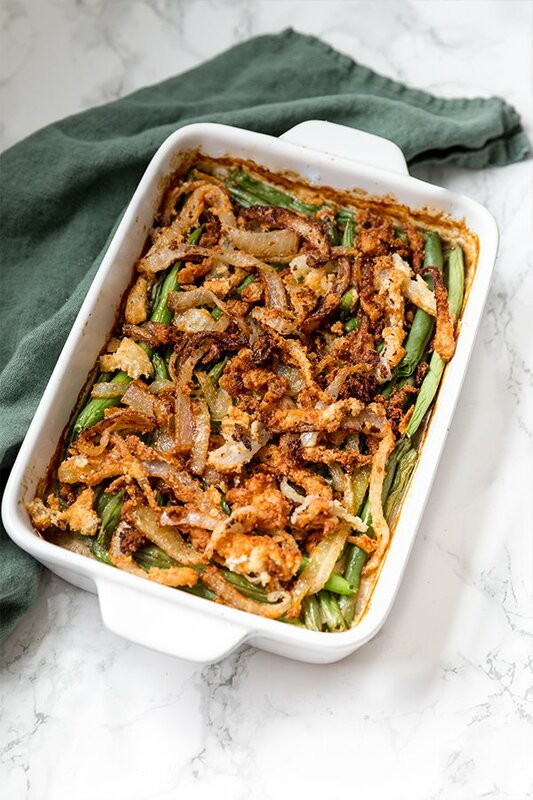 Paleo green bean casserole from scratch requires a bit of extra work, but Thanksgiving is the time to do it! You’re not able to just buy a can of crispy fried onions off of the shelf, or a carton of cream of mushroom soup, but these things are so good on their own that you seriously will wonder why you haven’t been making this from scratch all along! These are the main ingredients for the cream of mushroom soup. This soup is tasty enough to eat on its own, but for this recipe, we’re using it as the base for the casserole. If you want to save time on Thanksgiving day, you can easily just make this the night before. These are the ingredients to make the fried onions. I haven’t tried to make these with other flour combinations and can’t recommend any substitutions. Of course! You can save time by buying pre-trimmed green beans, but overall green beans are fairly low maintenance. Using a medium stock pot, melt the coconut oil on medium heat. Saute the mushroom and garlic for 4-5 minutes or until tender. Pour in the remainder of the ingredients, mix well to combine and bring to a simmer for about 10 minutes or until the soup thickens. Remove from heat and allow to cool before using an immersion blender or high-speed blender to fully blend the soup. Set aside. Fill a large stock pot about two-thirds of the way full and bring to a boil. Add the green beans and cook for 10 minutes or until fork tender. Strain and set aside. Preheat the oven to 400 F and prepare a large casserole dish. Combine the green beans and mushroom soup. Bake the casserole in the preheated oven for 15-20 minutes, while simultaneously cooking the fried onions (see below). Once the casserole is fully cooked, top with the fried onions and serve. Combined the two flours, salt, and pepper in a bowl and set aside. Set up a station with the bowl of flour, and another bowl with the coconut milk. Using a large deep skillet, melt the coconut oil and bring to a high heat. The oil has to be very hot to properly fry! Begin coating the onions by dipping them in the coconut milk, and then the flour mixture. Carefully drop in the onions and cook for about 2 minutes of each side before setting aside. You’ll fry all of the onions in about 3-4 small batches. Add more coconut oil if needed. 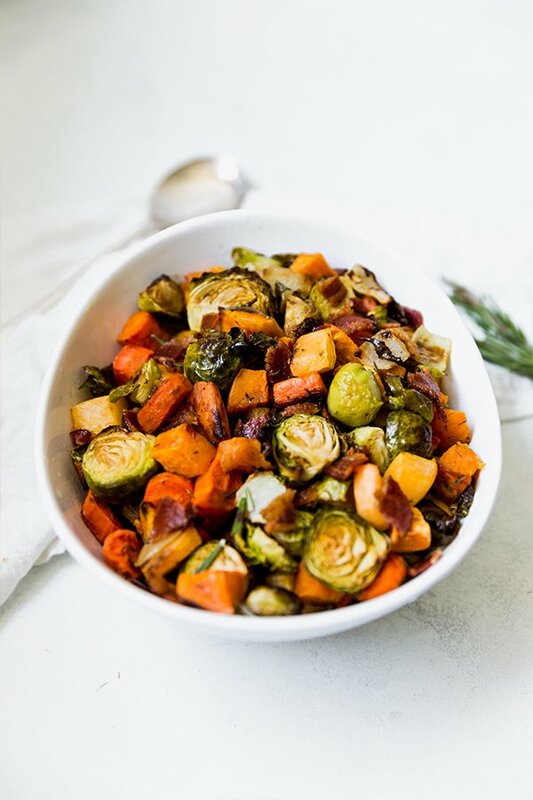 This harvest vegetable hash is an amazing fall side dish for weeknight dinners or even Thanksgiving! It’s paleo, whole30, and AIP. Let’s be honest… it’s hard to get in vegetables this time of year. Between Halloween, Thanksgiving, Christmas, and all of the holiday parties, veggies can be hard to come by. The holidays are incredibly sugar forward, and we all get thrown out of our normal routine a bit. However, some of the most delicious vegetables are in season this time of year, and there are plenty of delicious ways to still get them in! This Harvest Vegetable Hash is a great way to get in a wide variety of vegetables! 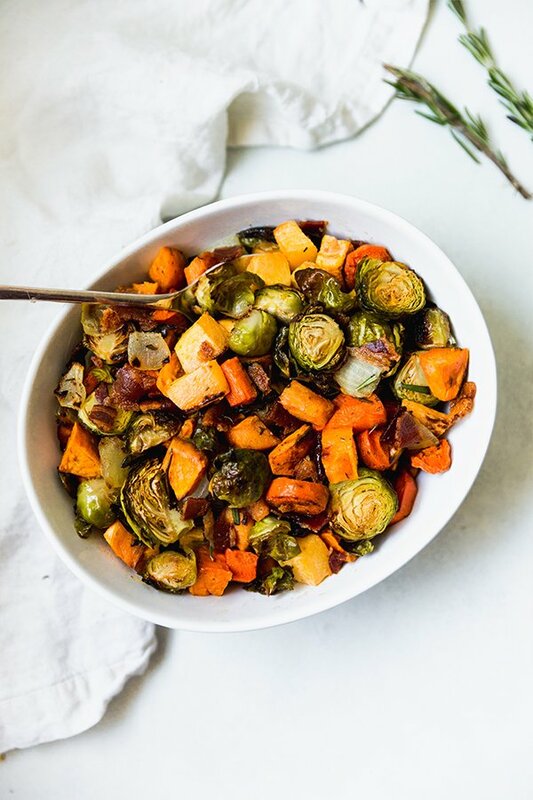 For some families, it can be a hard sell to reserve a spot for a vegetable dish on your Thanksgiving table, but this simple side is perfect to just slide in there. 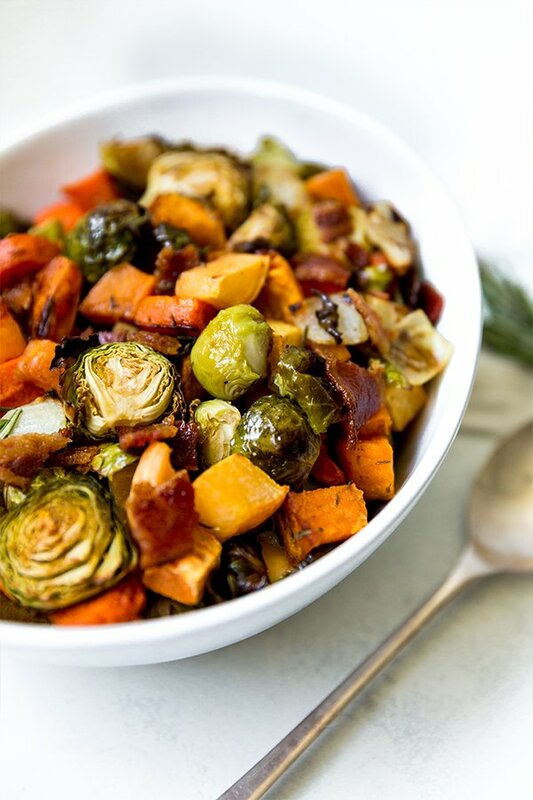 It’s made with root vegetables, just a bit of green from the brussels sprouts, seasonal herbs, and of course… bacon. Because, why not? So even if you’re not used to getting vegetable sides on your Thanksgiving table, this is a great place to start! You can use any variety of sweet potato that you’d like for this. Regular orange carrots are what I used for this recipe, but rainbow carrots would work as well. This is the one vegetable that may throw your dinner guests as they won’t necessarily recognize it. However, it tastes great in a hash like this and it mixes it up with some new nutrients. Gotta get the greens, right? Yellow onion is a bit sweeter than white and less spicy than red. It adds more flavor depth to the hash. This makes the dish just a bit more appealing to those family members that may be a bit wary of such a vegetable-forward dish at Thanksgiving. However, you can always leave it out and just add a different cooking fat. These poultry seasonings go great with fall flavors! Place the bacon slices on the baking sheet and bake in the oven for 18-20 minutes, or until the bacon is just cooked. Be sure not to over crisp it as it will be re-crisped in the oven. Chop the bacon and set it aside. Reserve the fat in the pan. Add all of the vegetables to the baking sheet with the herbs and salt and toss in the baking fat to evenly coat. Bake the vegetables in the oven for 30-40 minutes, or until crisp. Cook time will vary depending on sizes. Add the chopped bacon to the vegetable mix for the final 2-3 minutes to re-crisp and heat. Remove the vegetable hash from the oven and top with additional herbs for garnish and salt to taste. 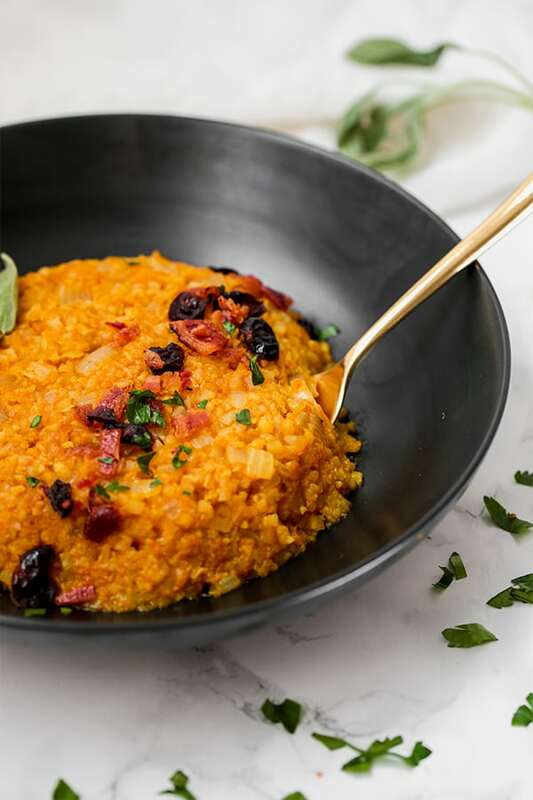 This cauliflower pumpkin risotto is a delicious autumn side dish! It’s the perfect balance of savory or lightly sweet and is paleo, whole30, and AIP compliant. I just love pumpkin season. Pumpkin is often seen as just another sweet treat but in reality, it can be a great ingredient for savory dishes. 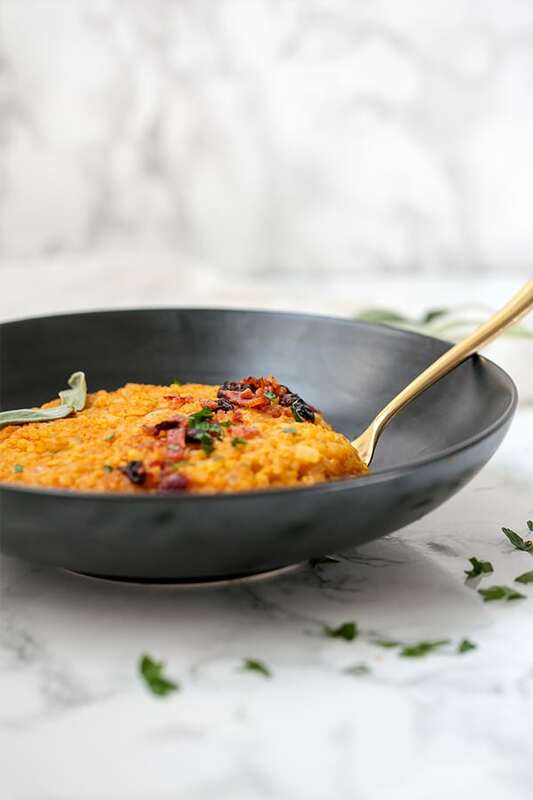 Pumpkin soup, pumpkin chili, and this cauliflower pumpkin risotto! Risotto is one of those dishes that I never really took full advantage of when I was eating grains. I started to regret that when I went grain free, but not for long! Even though risotto is a rice-based dish, it’s easy to make grain free with cauliflower rice. 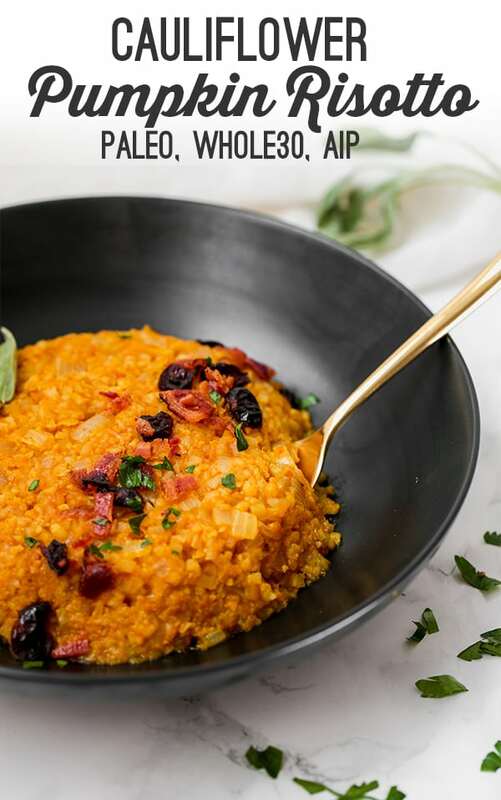 Not only does this simple swap make it grain free, but it instantly ups the nutrient density and makes this a much healthier dish than traditional risotto. Risotto is one of those dishes that seems super fancy and complicated, but it really doesn’t have to be! This risotto is simple to make but still impresses your family and friends regardless. Cauliflower rice is the swap for rice in this dish. You can buy pre-riced cauliflower from stores like Whole Foods, Sprouts, and even Target, or get a whole head of cauliflower and rice it in the food processor. Gotta, have the pumpkin this time of year right? I used canned pureed pumpkin. Chicken broth gives added flavor and body to the risotto. Chicken broth is mild and pairs better with the flavors for this dish, but you can also use a very mild flavored vegetable broth or beef broth. I’m always for adding bacon to savory dishes. The bacon adds some extra fat and protein, and flavor! You don’t need the bacon, but trust me… you’re going to want it. Make sure to get a sugar and oil free variety of dried cranberries like these. Pour in the broth, cauliflower rice, and pumpkin puree and season with salt, and sage. Stir well to combine. Reduce heat to medium-low and allow to simmer for 8-10 minutes or until the broth is mostly absorbed by the cauliflower. Remove from heat and top with dried cranberries, bacon, and parsley.